Home Blog What Can Aluminum Do For You? What Can Aluminum Do For You? If you’ve ever thought about purchasing an aluminum gantry crane, you’ve probably weighed the pros and cons to try to make an informed decision. There are many operations that are suitable for an aluminum crane, while others require something heavier—like steel. But, aluminum is more durable than some people may think. Today, we will provide an in-depth look at all-aluminum gantry cranes and aluminum I-beams to evaluate their unique advantages and potentially debunk some of misinformation floating around the Internet about using aluminum for material handling. Contrary to popular belief, aluminum gantry cranes are quite stable under load, and perfectly capable of lifting heavy loads and positioning them with precision and efficiency. These cranes are made from extruded high-strength 6062-T6-aluminum alloy, making them extremely strong and resilient. We receive a lot of questions about lateral bracing and durability in regard to our aluminum gantries, so it’s important to note that they’re designed for stable lift and movement. That’s because all loads are lifted directly under the I-beam (no side loading), and carefully designed following the standards set by the CMAA and OSHA. Furthermore, each aluminum gantry crane receives an initial load test of 125 percent to ensure quality and safety—including lateral bracing. Because of their portability and durability, aluminum gantry cranes are often used for HVAC applications. HVAC applications require a portable overhead crane system that can be easily transported up stairways, onto roofs, and in other challenging locations. Once the crane is positioned, it’s capable of lifting very heavy HVAC units, and it’s lightweight design allows one worker to move the crane under load quickly and easily. Although they come with heavy-duty, four-position, swivel-lock casters with moldon polyurethane wheels, they can also be fitted with pneumatic tires, which are perfect for soft roofs or fragile ground. A standard all-aluminum gantry crane can actually lift loads up to three tons. Their height adjusts in six-inch increments (up to 12 feet) using spring-loaded steel locking pins that automatically engage when height positioning holes are reached. This is extremely useful for specific lifts, uneven floors, or facilities with many obstacles. These systems also provide span adjustability (up to 20 feet) for transport through narrow aisles or to increase coverage as needed. Best of all, despite their heavy lifting and durability, these gantry cranes are extremely portable. In fact, a one-ton aluminum gantry crane can be as light as 116 pounds. Compared to an all-steel model, most aluminum gantry cranes weigh less than half as much. For example, a two-ton aluminum gantry crane with a 10-foot overall span weighs around 274 pounds, whereas a two-ton steel gantry crane with the same span can weigh as much as 700 pounds. Aluminum gantry cranes are not only durable and lightweight, they’re also quickly and easily assembled and disassembled, which makes them popular with contractors who need to carry their lift equipment in service trucks from one job to another. Because aluminum is corrosion resistant, they’re also ideal for refrigerated areas, clean rooms, and other controlled environments. With a myriad of unique features, options, and accessories, aluminum gantry cranes are a great solution for cost-efficiency, heavy lifting, portability, and flexibility. For applications that require a lightweight gantry crane with three-way adjustability, a steel gantry crane with an aluminum I-beam is also a great option. The aluminum I-beam significantly reduces gantry weight (compared to a steel I-beam), particularly on higher-capacity cranes. For instance, a steel I-beam that weighs 250 pounds is easily replaced by an aluminum I-beam that weighs 90 pounds. For applications that require lift up to three tons, aluminum I-beams are cost-efficient, portable, and far easier to move under load than their steel counterparts. While a steel gantry with an aluminum I-beam is still heavier than an all-aluminum gantry crane, it has its advantages. 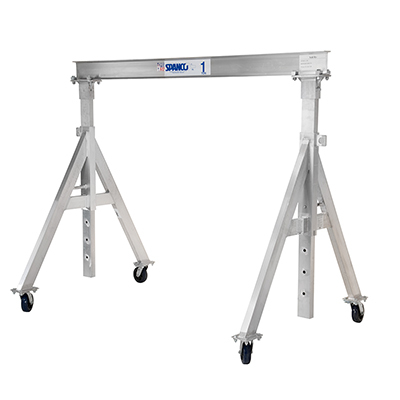 The steel gantry with aluminum I-beam is three-way adjustable, which includes span, height, and tread. Their adjustment flexibility allows for safe use on uneven floors, easy passage through doorways, aisles, and under mezzanines or other overhead obstacles. The gantry’s design leaves the aluminum I-beam free to pivot as it self-centers over the load and the A-frame design helps to maintain greater stability. This eliminates the swaying motion common to other three-way adjustable gantry cranes with aluminum I-beams. While the I-beam is made from the same extruded high-strength aluminum alloy outlined above, the main legs, brace legs, and caster frames are made of heavy-gauge steel, square tubing with zinc-plated hardware. The adjustable span uses a locking device to hold the I-beam securely in place during adjustments and when set. The adjustable tread is accomplished using a cable assembly bolted inside the caster frame tubes to prevent overspreading. Contrary to popular belief, aluminum gantry cranes and aluminum I-beams are not unstable; they’re carefully designed to meet the appropriate rated load capacity for superior stability and endurance. Depending on the needs of your particular application, all-aluminum gantry cranes are the very definition of efficiency and mobility, while their steel with aluminum I-beam counterparts are designed for convenience and flexibility. Either way, these systems can serve very unique purposes, and with a variety of potential options, accessories, and customizations, the possibilities are endless.